Called "Land Below the Wind" because it lies just south of the Philippines typhoon belt, Sabah is Malaysia's second biggest state. It occupies a large part of the land mass of Borneo, and has a cluster of islands, including Pulau Banggi, Malaysia's biggest island. Many of its forested areas are protected wildlife reserves. Sepilok has the world's oldest and biggest orang-utan sanctuary. The island of Sipadan is famed among scuba diving enthusiasts, while Pulau Selingan, Pulau Gulisan and Bakkungan Kecil comprise the protected Turtle Islands Park. Sabah is also called "Land of the Sacred Mountain", because it is home to Mount Kinabalu, Malaysia's highest peak, reaching 4,085 square metres above sea level. The mountain is inside the 754-square-kilometre Kinabalu National Park, which is a World Heritage Site. Sabah's state capital is named after the mountain, which is about three hours drive from the city centre. A relatively new city, Kota Kinabalu offers few glimpses of its colonial past. Instead, it is an intriguing mix of traditional stilt homes on the coast, a mosque with a gold-plated dome, Western-style hotels, a circular glass building with a revolving restaurant and new condominium high-rises. 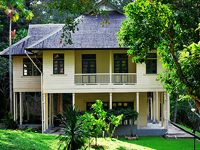 Many wealthy Malaysians and foreigners invest in vacation homes in Kota Kinabalu, such as villas with their own swimming pools. One of Malaysia's most populous states, Sabah's population includes more than 30 ethnic groups, though some of its 100 or so dialects are dying out. Many tribes offer village tours and homestay programs. The biggest ethnic group in Sabah are the Kadazan Dusun, and the Monsopiad Cultural Village (named after the tribe's legendary warrior) gives an intimate sample of their lifestyle. The weekly open-air market, or tamu, is another intercultural experience. The most popular tamu is the Sunday Market at Kota Belud, north of the capital. Sabah was once under the Sultanates of Brunei and Sulu. It then came under British rule until it became part of Malaysia in 1963. Religious holidays observed include Christmas, Wesak (the Buddha's birthday) and Hari Raya, the Muslim Day of Fasting. Sabah's main industries are forestry (timber), fishing, mining, and the production of petroleum and natural gas, cocoa, oil palm and rubber.